I try to spend money on storage options out in the open that one can see and try to spend next to nothing on hidden away storage. Just this weekend, Al asked if we could recycle a few old take out containers we’ve had laying around, simply because they’ don’t stack properly with our other reusable containers and keep falling out of the cabinet…literally every time it’s opened. They’re decent containers though, they have a tight fitting, snap on lid and aren’t too deep so they fit in small spaces. I decided to use them for some things around that house that have otherwise just been thrown in a drawer or cabinet. Gave these containers a good wash and dry and found them a nice place to live. When I get my label maker that I’ve been patiently awaiting you can guarantee that there will be labels on each of these puppies. Not bad for some extra organization in hidden away places. 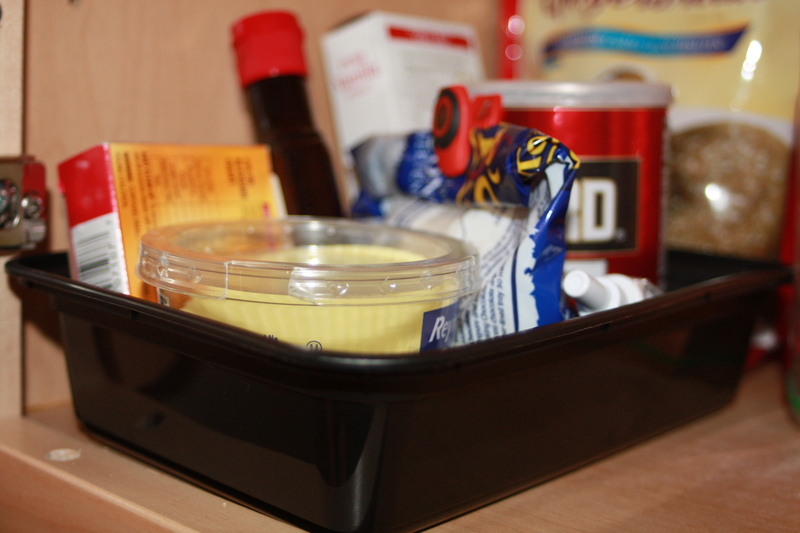 Do you have another purpose for reusable takeout containers? Crayons or art supplies for children, treats for pets, crafting supplies for you? Please, do share! If you poke some holes in the bottom they are great for starting seeds and also for a ray for plants with no saucers. I know this isn’t hidden and more pedestrian but they work. This is genius! So obvious and simple, but I can’t believe I haven’t thought of it before! I’m notorious for buying all sorts of storage stuff when I have perfectly good stuff lying around. Maybe when we move into the new house this weekend I can turn over a new leaf, haha! Great suggestion, Nina, especially since we are getting ready to start some planting…a little late in the season! Emily, good luck with the move. 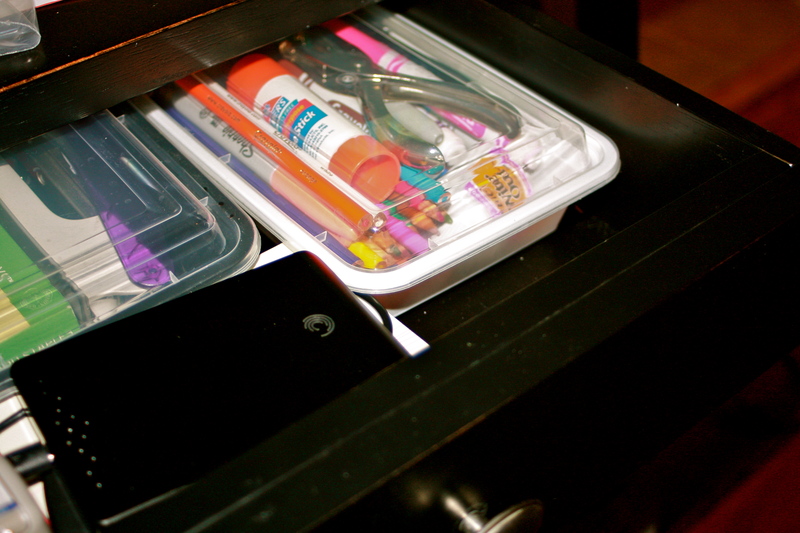 Hope you find endless storage solutions! These are really good for holidays too! We ususally have a ton of leftover food that we send off with family, and we send it in those containers. 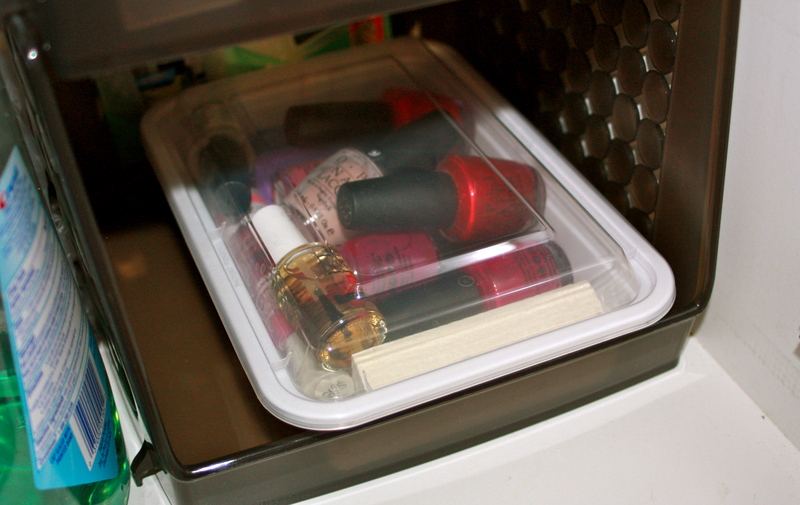 That way you don’t lose any of your good tupperware. We use them for freezing leftover sauces that we make, and other stuff too!